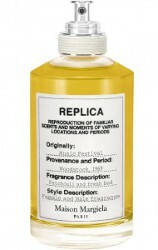 Maison Martin Margiela will launch Music Festival, a new unisex fragrance in the Replica series. Music Festival was inspired by Woodstock; the description on the label is "Patchouli and fresh bud". The feeling of a vibrating atmosphere on a music festival on a sunny day. The notes include cannabis, apple, violet leaves, patchouli, tobacco, incense, leather accord and cedar. Maison Martin Margiela Music Festival is available for pre-order at Essenza Nobile in Germany, in 100 ml Eau de Toilette. Cannabis and tobacco notes, sounds about right. Guessing it will not be strong enough to call up a music festival — but we’ll see!